With spring weather returning earlier than expected, it was time to get planting started for the year of 2016. Left over from last year's garden were some grapevines gone dormant, an empty blue tub previously containing tomatoes, and a dead mint plant. My first order of business was to reinstall the blue tub with some "cold weather" crops; lettuce, bok choy, and green onions. This will provide some lunch food. As I now had a proper backyard to grow plants in, my growing space could be expanded. I had some old green totes lying around, so I decided to use them for expansion. I put some holes and gravel in the bottom of each bin for drainage, so the plants inside won't be swamped over during rainy weeks. 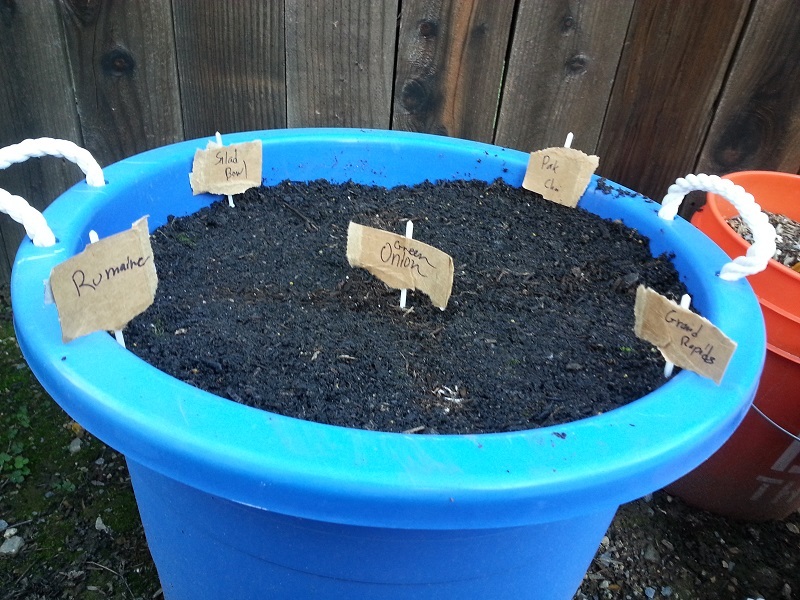 My growing plants for this season and summer include Bok Choy, several varieties of lettuce, spinach, Swiss Chard, onions, tomatoes, and chili peppers. In addition to using old seeds, I acquired some new varieties, Bright Lights Swiss Chard and Anaheim Chili Peppers. For now the peppers and tomatoes will be started in small pots indoors until the weather is warmer and the fast growing winter crops are grown and harvested. I've dedicated one of my bins to grow Swiss Chard all year around. Inside I'm using three varieties: Fordhook Giant (white), Ruby Red, and Bright Lights. Aside from getting a leg up on my growing season, if certain seeds don't germinate, that tells me which of my seeds I need to remove from my inventory before the next season. With appropriate weather conditions, I expect to see these plants germinate in 1-2 weeks.